Back to what I wrote before. Our 30 day tour of the islands off the coast of Thailand was unforgettable, it left images planted that won’t be forgotten. We have hours of video and hundreds of photos, so when our minds start to fail I can just log on to whatever “cloud” we use in 20 years. Kelly is working on more about that, so it’s all her fault if more isn’t posted soon:) The two of us have fun giving each other flak about procrastinating when it comes to family updates. Slackers! As I write we’re on our way by bus to Saigon (Ho Chi Minh City). I’ve got a mix of Vietnam War era classic rock blasting on my iPod. Sounds cheesy, but I had to, it seemed right. For me, listening to the music of that time is a way to relate to a war ending within a year of my birth. Adults over 40, back home & here in Vietnam don’t need the music, they lived it. It’s loud enough to drown out the DVD playing on the screen at the front of the bus, a strange, outdated gameshow in a language I don’t understand. 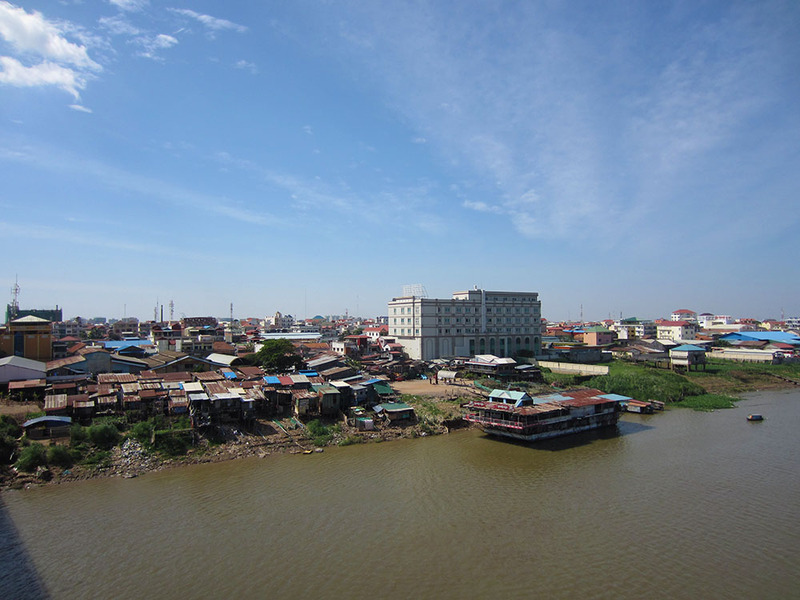 We’re crossing the Mekong Delta, scenery from the road is a mixture of small shops and markets, irrigated green rice paddies, cows, irrigation canals and bridges. I find myself curious about the generation before mine, feeling fortunate to be visiting in 2015 and not 1968. I typically spend most of our bus/train rides staring at the landscape as it zips by, but this bus is fancy shmancy– it has wifi– so I join the crowd, my eyes and fingers glued to a screen…Googling “Vietnam War, Mekong Delta” & “Communism, Vietnam”. 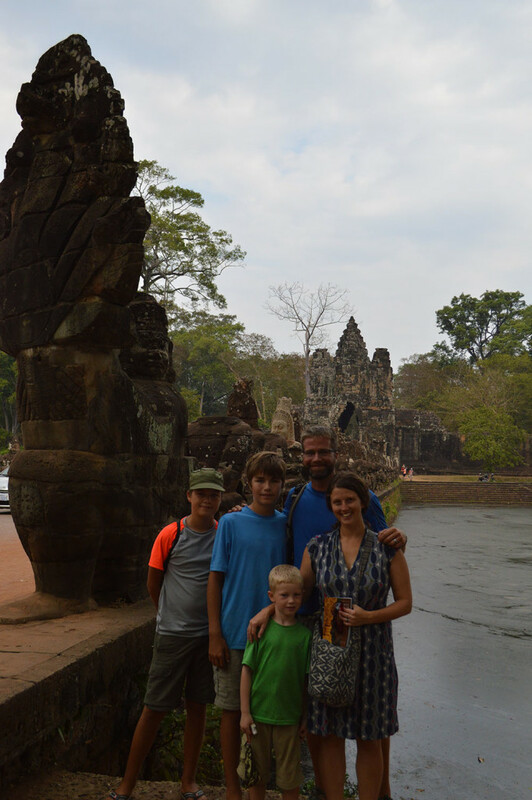 The focus for this post is our trip through Cambodia. Looking back, I wish we spent more time there. It was a fascinating country. 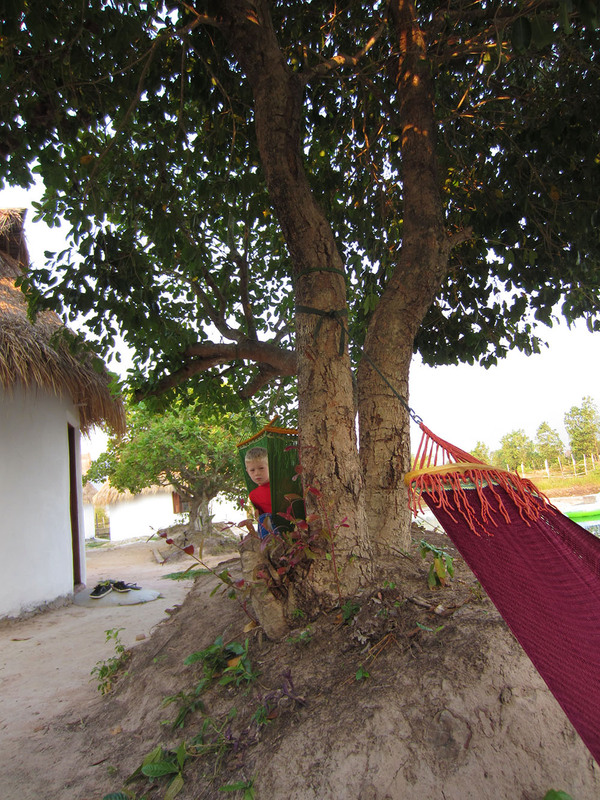 We stayed for three weeks or so, in four different guesthouses. 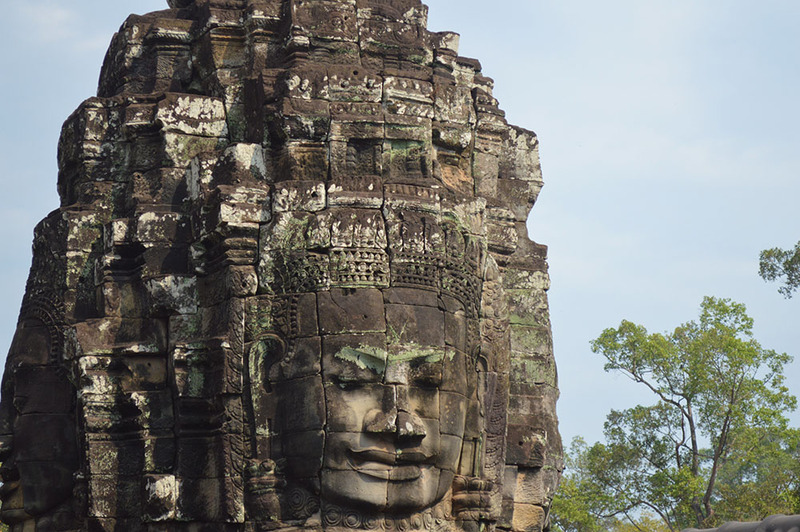 Crossing the border from Thailand to Cambodia was relatively painless, the departure/entry visa business took about 3 hours. We stayed one night in the border town of Poi Pet, the dirtiest city I’ve ever set foot in and far from a good representation of the country. All five of us were exhausted and just needed a place to sleep. 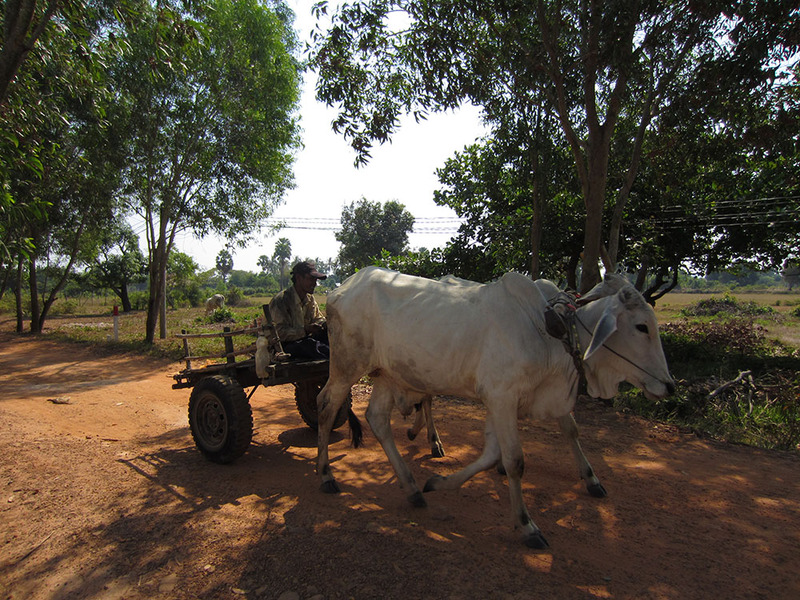 The next day we hired a guy to drive us about four hours to Siem Reap. 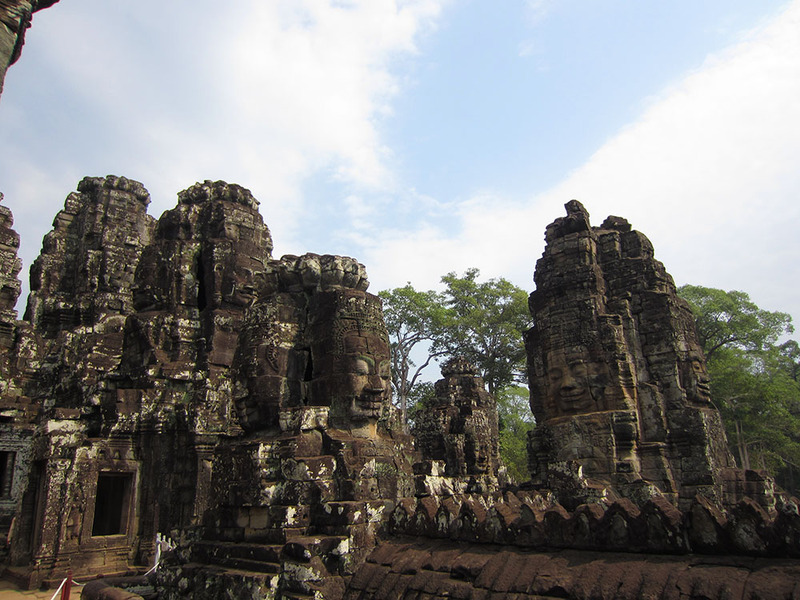 Siem Reap is known for it’s temples that date back somewhere in the vicinity of 1000 years. 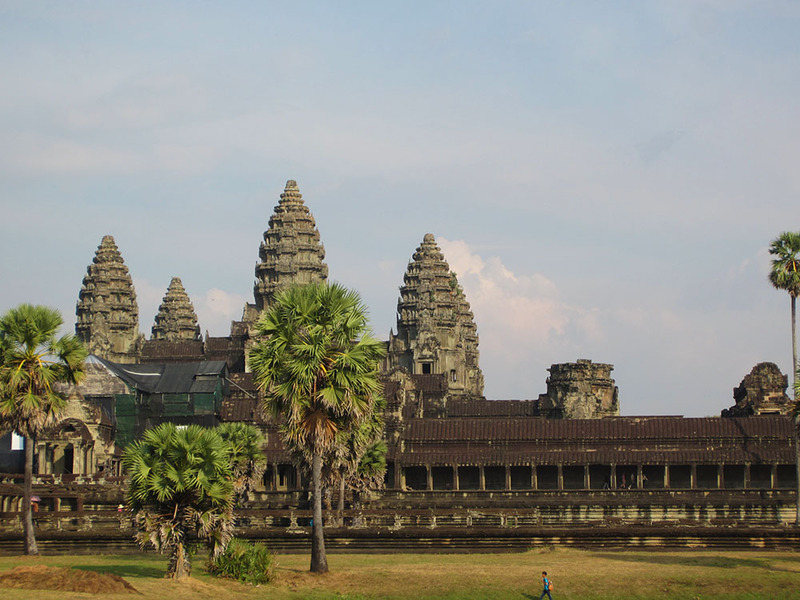 The most well known is Angkor Wat. 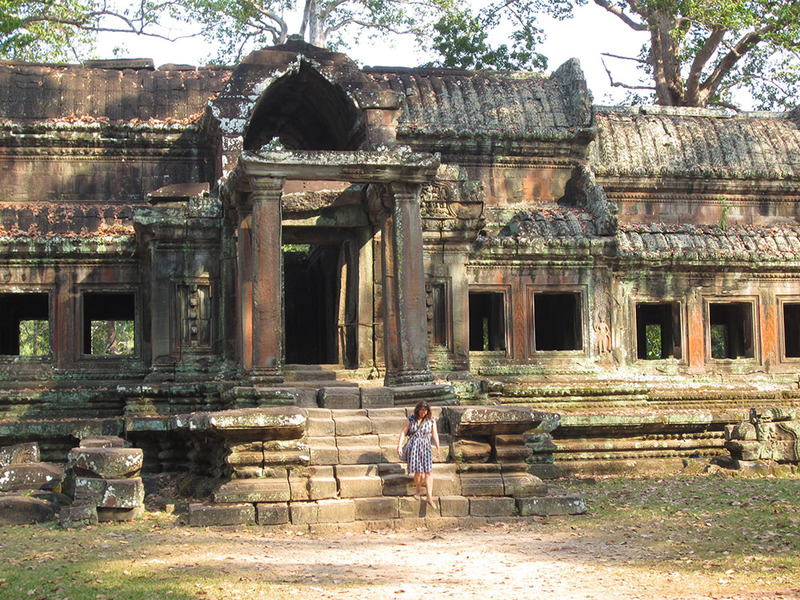 One could spend several days exploring the area, as dozens of these ancient temples are spread across hundreds of square kilometers here. We decided that the single day tour would work best for the five of us. 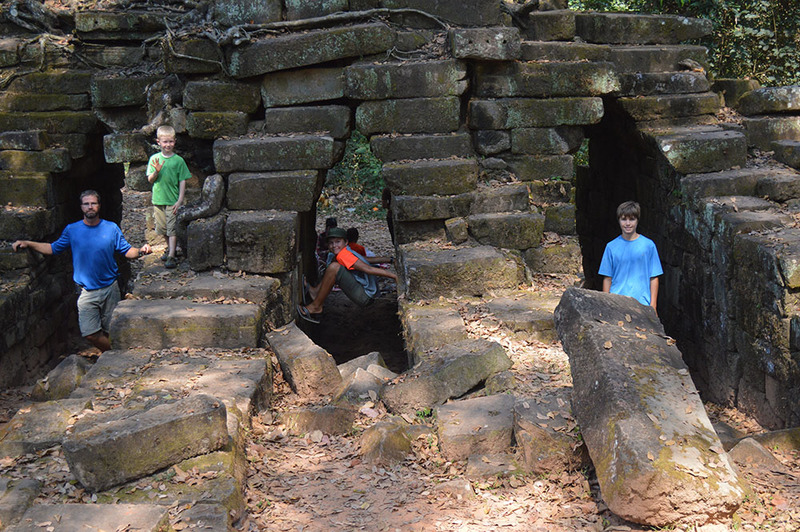 We managed to climb around on seven different temples by the end of the day. 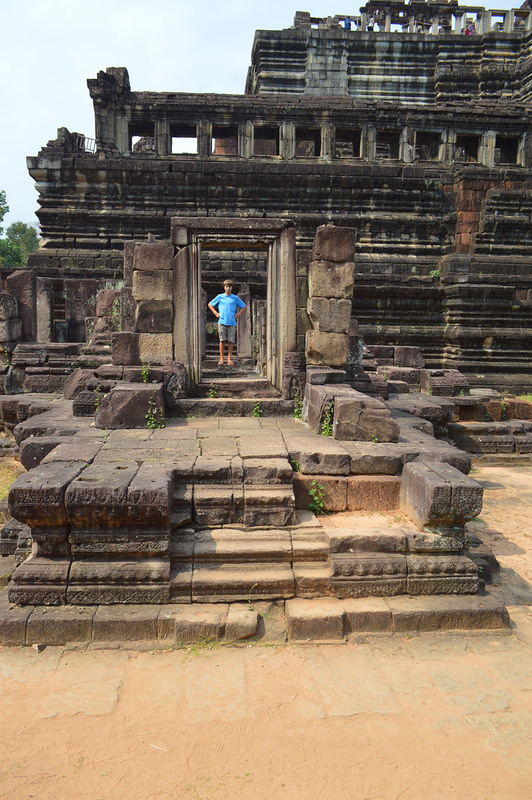 An amazing, mystical place, that unfortunately left me somewhat jaded. Many, many tourists (of which we were 5). 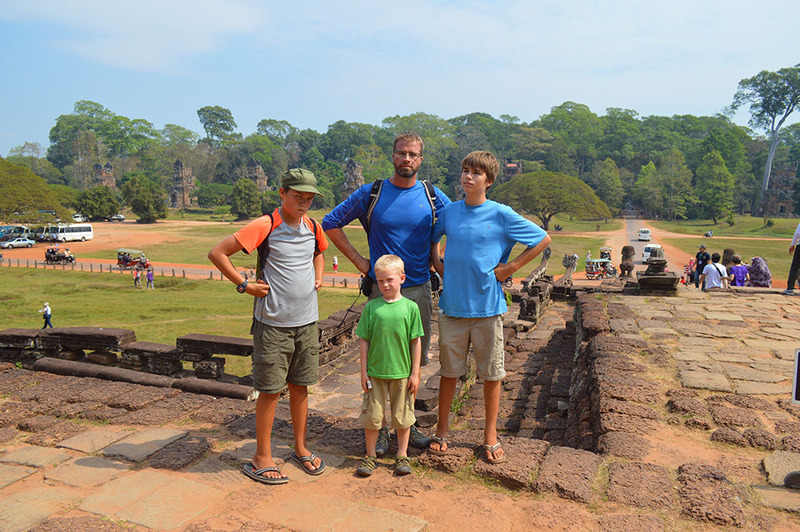 I read 2 million people per year visit the temples near Angkor Wat…needless to say, it wasn’t easy to get a photo without another camera toting stranger in it. How they lifted that stone in place without a crane and 200’ of stick baffles me. Slave labor I suppose. 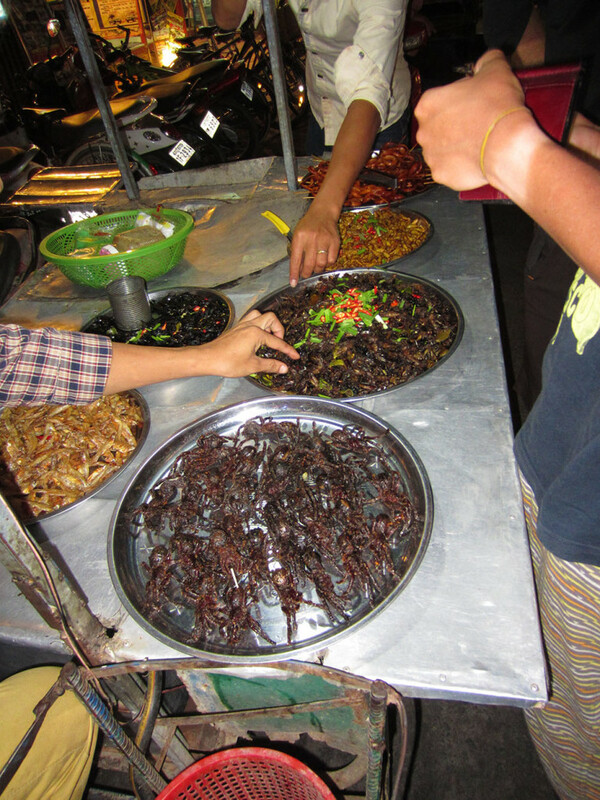 Siem Reap has the same type of markets set up in all tourist cities, I’ve seen enough of these. Trinkets, trinkets, and more trinkets, all advertised as authentic, but made in the counrty to the left or right. I do however, get a kick out of the haggling that goes on. I refuse to pay a tuk tuk (SE Asia’s version of an unmetered taxi) driver NYC cabbie rates. If he says 4 bucks I say 2, then he says 3, then I say 2 and start to walk away with the kids. Then he says ok with a smile and away we go. Arguing over 2 bucks makes me sound cheap, doesn’t it? Haggling is a way of life over here, if the locals thought they could get me for $20, they would. Good lessons for getting Brice’s equipment shipped for less on AML. Watch out Nelson. 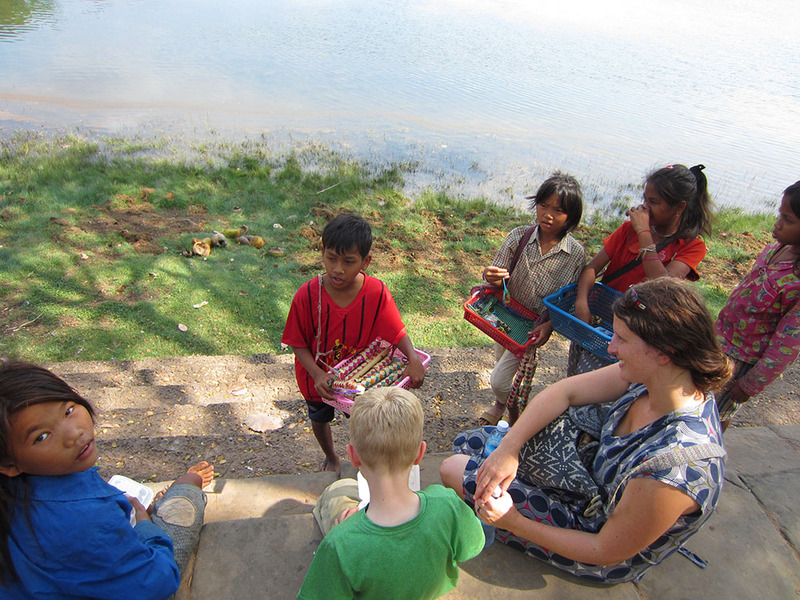 Kids selling toys & souvenirs, likely put to work by their parents or caretakers. A sad & common reality in Cambodia. 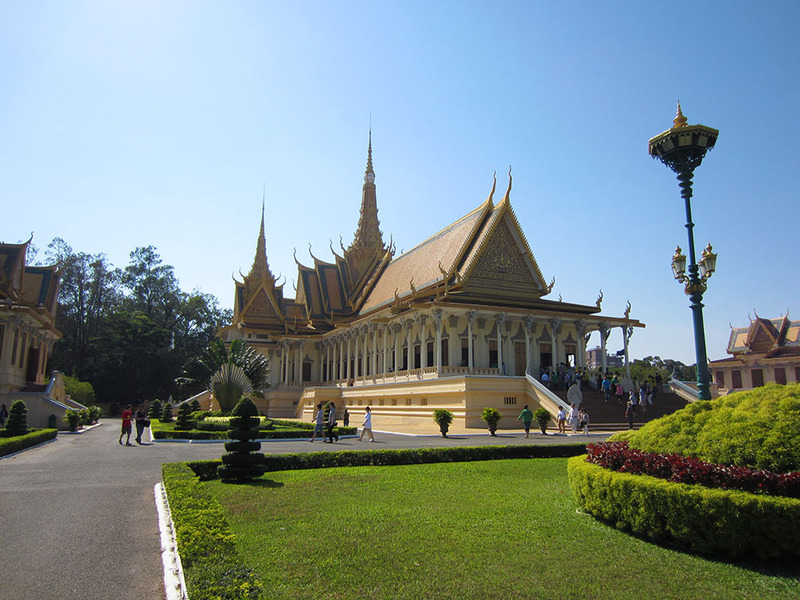 After Siem Reap we made our way by bus, about 5 hours to Phnom Penh, Cambodia’s capitol. I’m not sure what the population of this city is, but it’s the largest of the country, and has a mind blowing history of it’s own. Actually the country as a whole does. 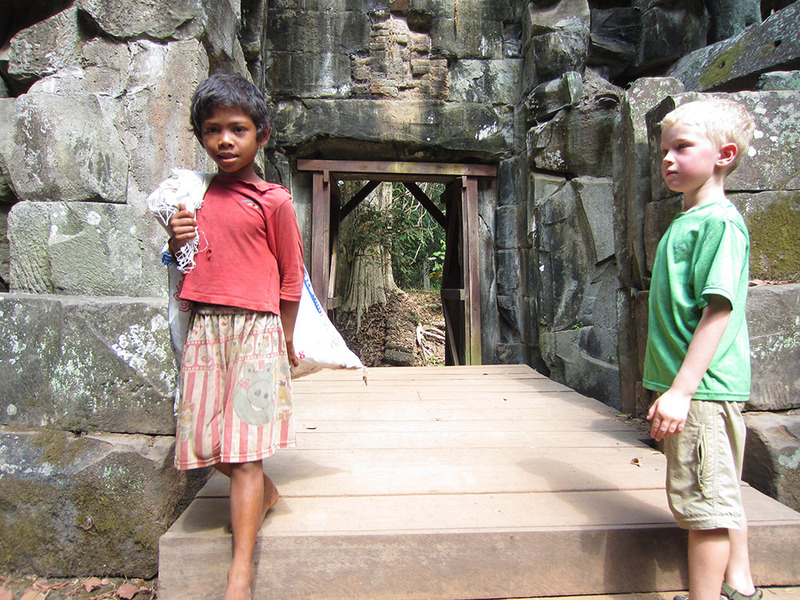 From 1975-1979 the Cambodian people became victims of a horrendous act of genocide. A Cambodian alive during this time either escaped to Thailand or was enslaved, tortured & potentially murdered by the Khmer Rouge. 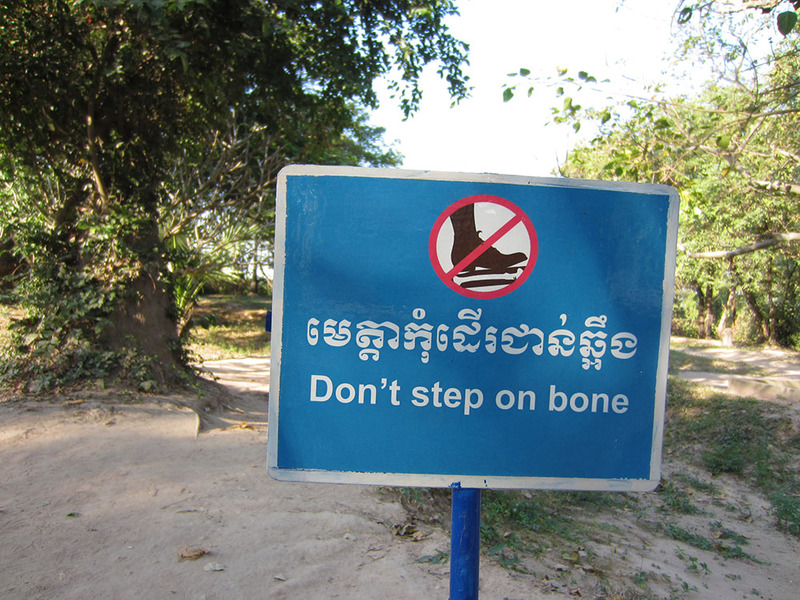 Visits to the Killing Fields and the Tuol Sleng Genocide Museum were heavy. 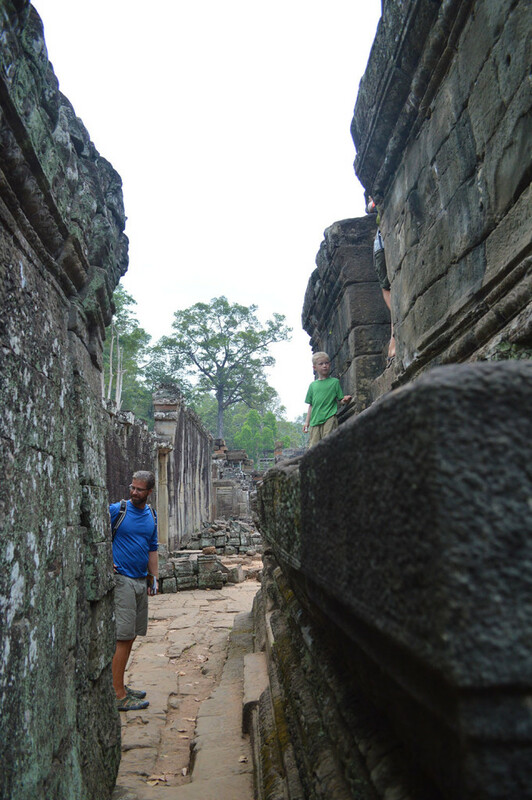 Estimates say two million people died during this dark time, both of these historical sites gave us a small glimpse of what the Cambodian people endured 40 years ago. We are lucky to live where and when we do. 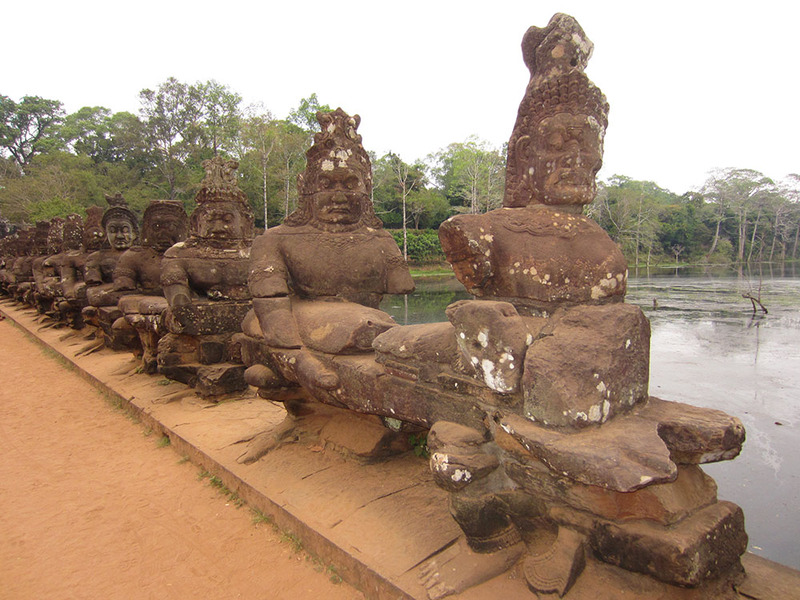 If SE Asia ever makes it onto your travel itinerary, you must visit this country. Spider for snack time? Anyone?? 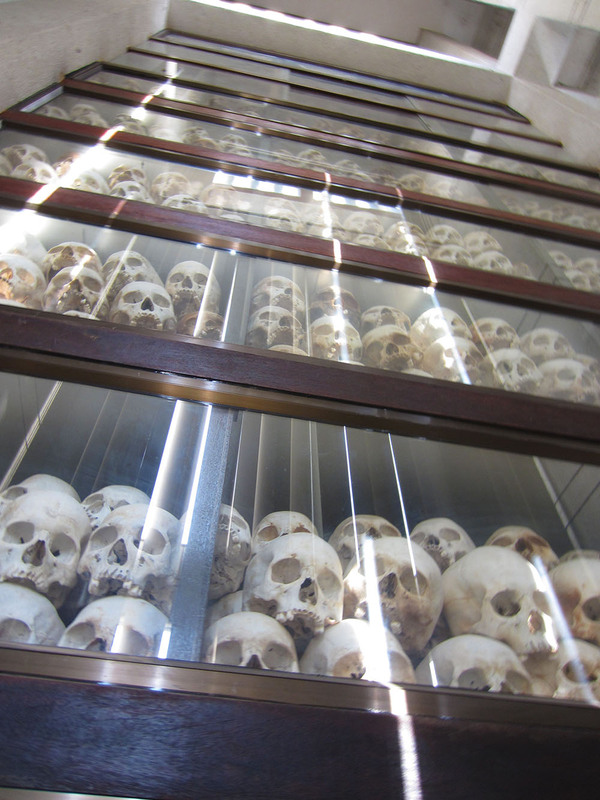 Commemorative stupa filled with the skulls of the victims at the Killing Field outside Phnom Penh. 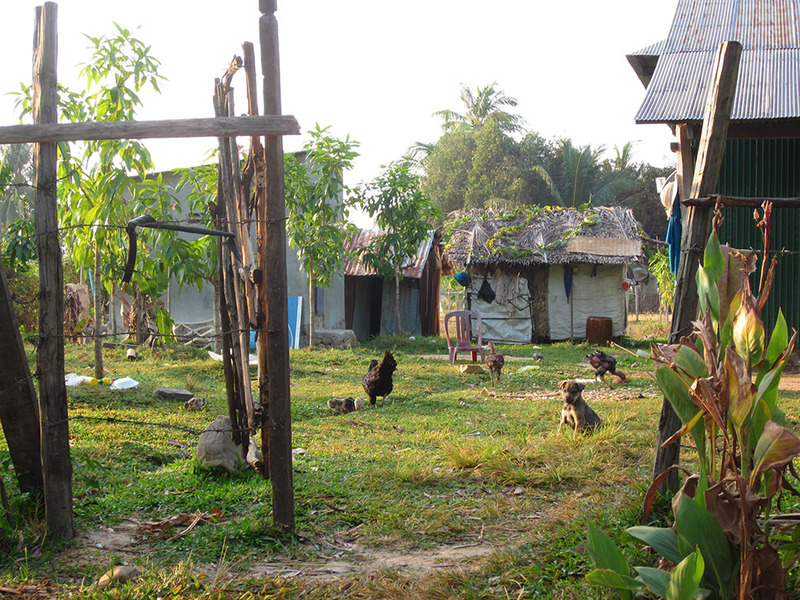 After about nine or ten days we made our way east, close to the Vietnam border to Kampot. We stayed in a unique place called Bohemiaz, about five or six kilometers out of town. It had great food, of both local and western fare. Portions were large so the boys were in heaven. I took many walks through this remote part of town. Some on my own and some with the family. 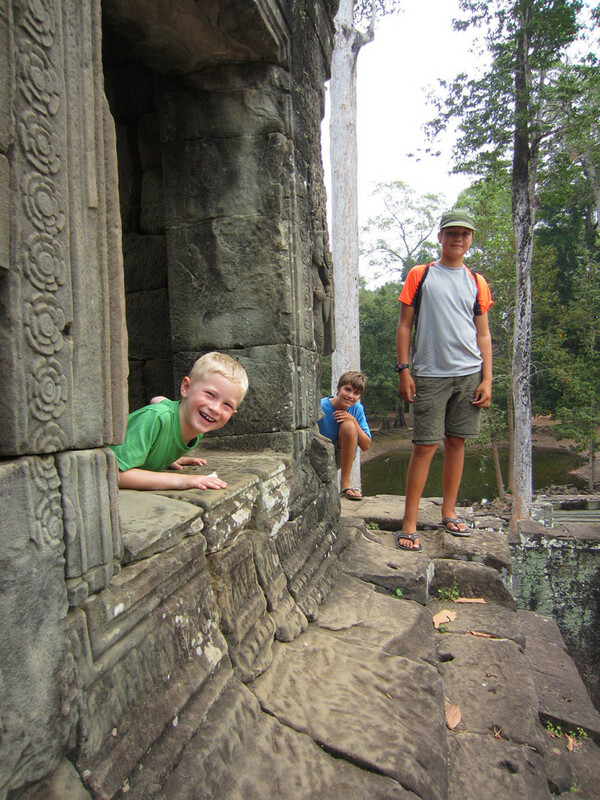 The Cambodian kids are definitely learning English in school and were somewhat fascinated by us westerners. Every kid we passed would wave and say, “Hello, how are you? 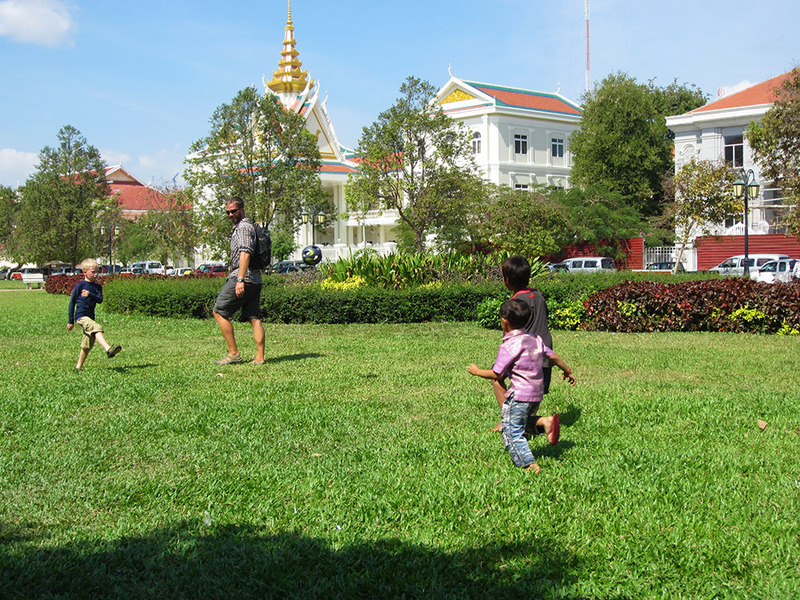 !” This is a place in the early stages of tourist development, so the locals haven’t become jaded due to the constant influx of money and western culture. Many smiles and “hellos” from townfolk made me feel more comfortable than any place we’ve visited thus far. They felt genuine. At one point I was invited from the one lane dirt road I was walking, into a family’s home. 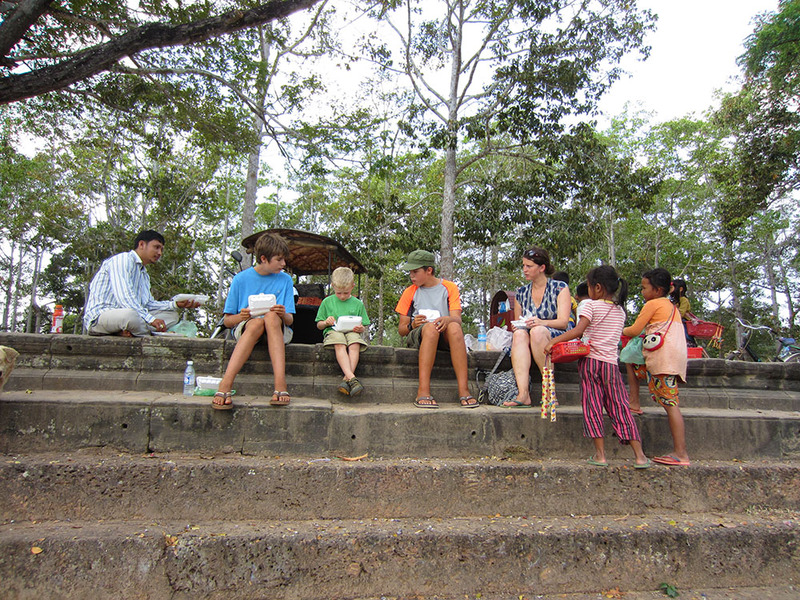 It was a short visit filled with smiles and confusion due to the language barrier. I walked away wondering about what I would do if the situation was reversed. I can’t remember ever inviting a complete stranger into my home. 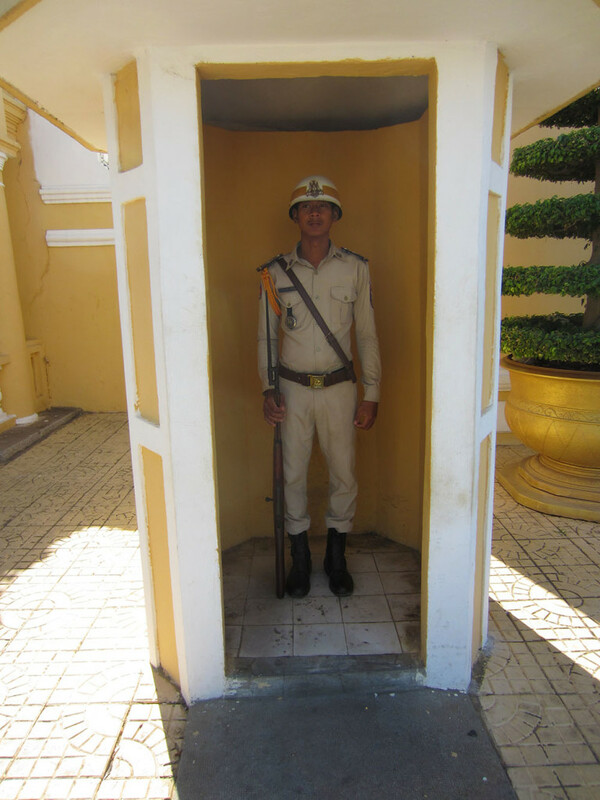 Admittedly, I don’t trust like the Khmer people do. 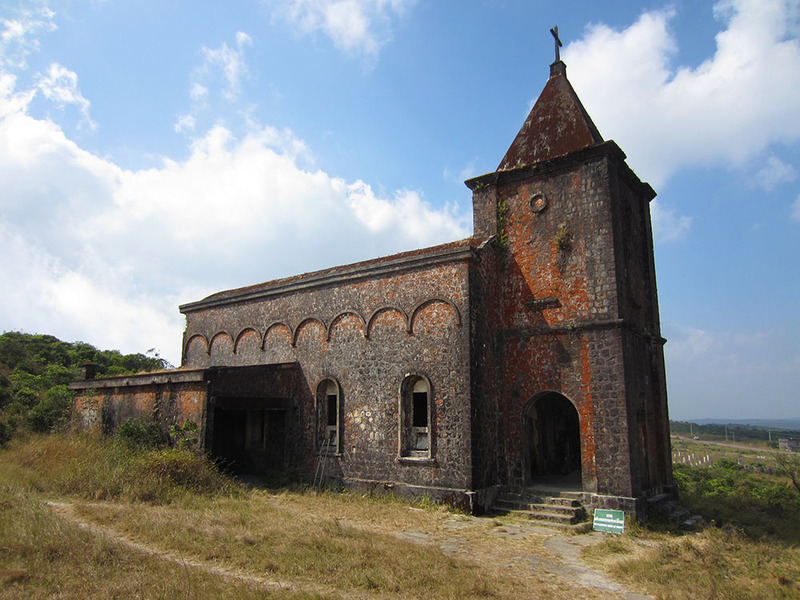 Bokor Hill Station Church. 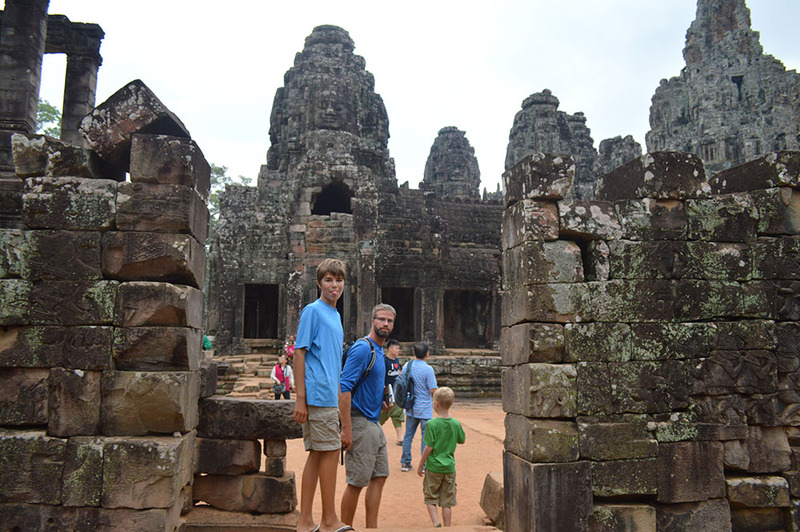 Alex and I toured it by motorbike with a German fella we met in Kampot. 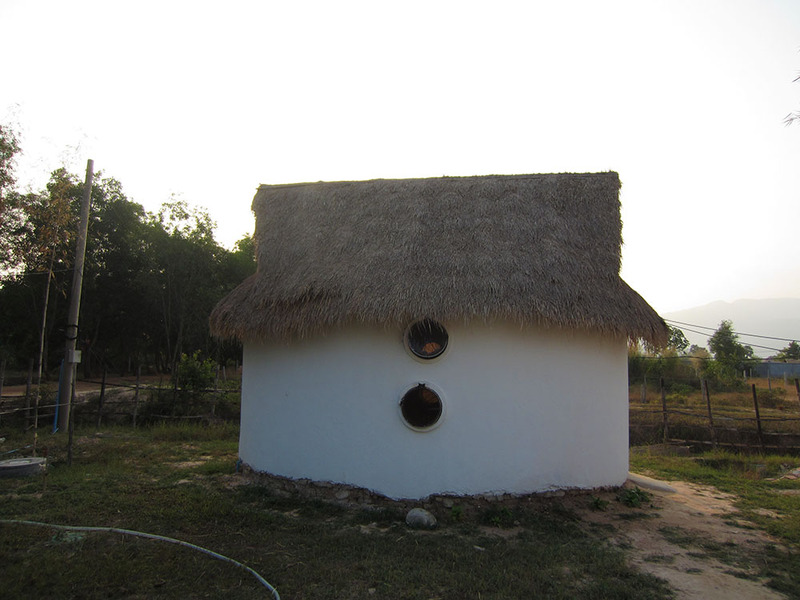 Our hut, 5 km outside Kampot, Cambodia. 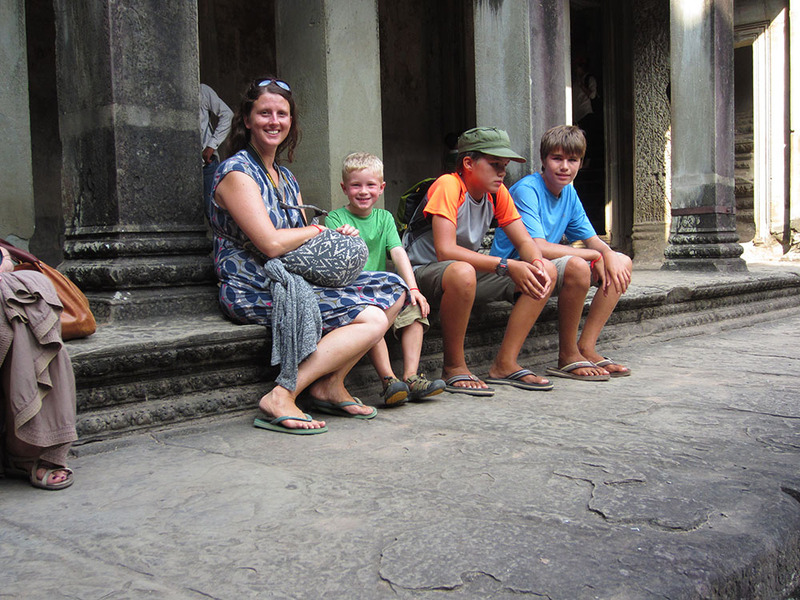 One of Alex’s favorite Cambodia moments! Sorry for the abrupt end, but that’s all I had at the time. Until next Christmas!!! I’m out. 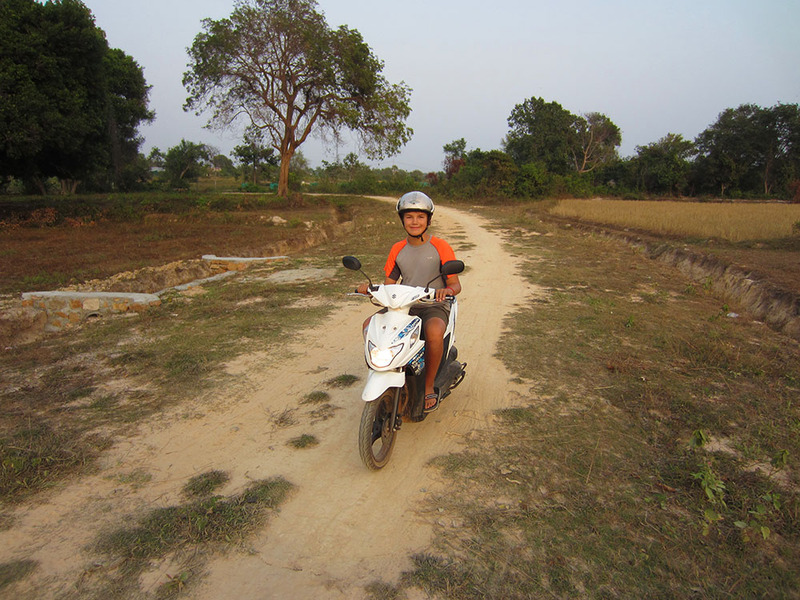 Hahaha…..Alex sure looks happy on that scooter….!!!! Great photos….!! Hope you guys continue to do well…..! See you guys down the road…! !